2 Wire tie with clip Antenna bracket Adjusting the Control Unit Use a small flat-tip screwdriver to change the mode switch and the horn/siren switch and to adjust sensitivity. The horn/siren switch must be set in the "HORN" position. Washer-bolt GLASS BREAKAGE SENSOR MODE SWITCH Flange nut TOOLS AND SUPPLIES REQUIRED Small flat-tip screwdriver Phillips screwdriver Center punch Eye protection (face shield, safety goggles, etc.) Drill 5.5 mm and 12 mm Drill bits Tape measure File Felt-tip pen Ratchet 10 mm, 12 mm, and 14 mm Sockets Piece of cardboard Diagonal cutters Electrical tape Torque wrench Illustration of Security System Installed on the Vehicle DISARM SWITCH FUSE CASE (2A) 4-PIN RELAY CONTROL UNIT 6-PIN RELAY M MIN MAX Mode Switch: Set the mode switch according to the customer s choice. Refer to the Owner s Manual for the explanation of each mode. Glass Breakage Sensor: AUTO LOCK AUTO MANUAL SENSITIVITY ADJUSTMENT KNOB Do not attach anything like scotch tape over the holes; this is a microphone pickup. Sensitivity Adjustment Knob: SIREN HORN Adjust the sensitivity only if the customer requests it; the sensitivity adjustment of the glass breakage sensor is factory-set. Be careful when you adjust the sensitivity; if you raise the sensitivity too much, the security system can give a false alarm, and if the sensitivity is too low, the security system may not work even if glass is broken. 2 of 8 AII (0310) 2003 American Honda Motor Co., Inc. - All Rights Reserved. 4 7. Push the four grommets into the square holes in the bottom of the driver s seat cushion. DRIVER S SEAT 11. Install the control unit bracket and the 4-pin relay onto the bottom of the driver s seat cushion (three self-tapping screws). CONTROL UNIT BRACKET DRIVER S SEAT GROMMET 8. Install the control unit on the control unit bracket (two 4 x 30 mm screws). 6-PIN RELAY 9. Install the antenna bracket on the control unit bracket (one 6 x 12 mm washer-bolt and one 6 mm flange nut). SELF- TAPPING SCREW 4-PIN RELAY SELF-TAPPING SCREW 4 x 30 mm SCREWS 12. 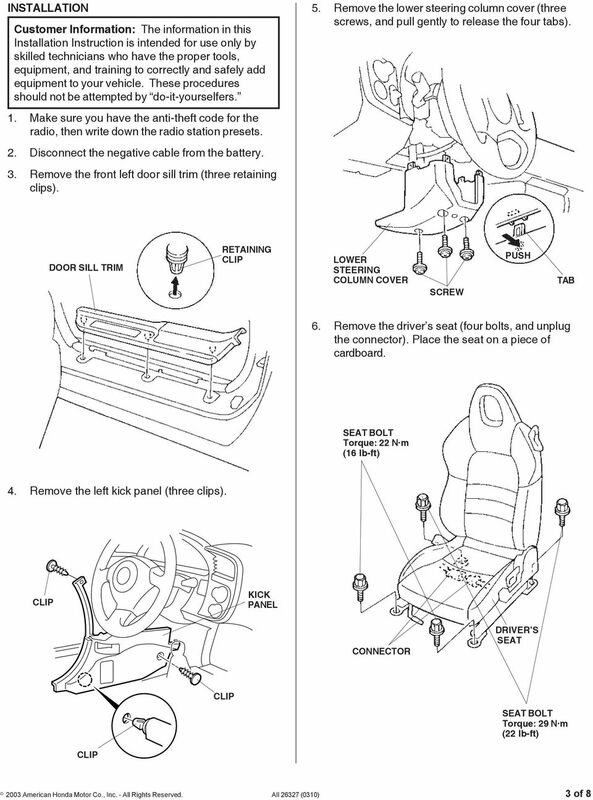 Install the 6-pin relay onto the bottom of the driver s seat cushion (one self-tapping screw). CONTROL UNIT ANTENNA ANTENNA BRACKET 60 mm CONTROL UNIT BRACKET 6 x 12 mm WASHER-BOLT ANTENNA BRACKET WIRE TIE WITH 6 mm FLANGE NUT M 10. Attach the wire tie with clip to the antenna, then push the clip into the hole in the antenna bracket. 4 of 8 AII (0310) 2003 American Honda Motor Co., Inc. - All Rights Reserved. 6 17. On the driver's side, lift up the floor carpet, and route the 22-pin, 4-pin, and 6-pin connectors from the security system harness out through the cutout in the floor carpet. 4-PIN 22-PIN 19. Route the two 17-pin connectors from the security system harness forward and under the carpet. VEHICLE 17-PIN (Unplug.) BLUE TAPE (Remove.) VEHICLE 2-PIN 6-PIN GREEN TAPE WIRE TIE VEHICLE CORRUGATED TUBE 17-PIN 2-PIN M M 20. Next to the hood opener lever, locate the two vehicle harness 17-pin connectors. 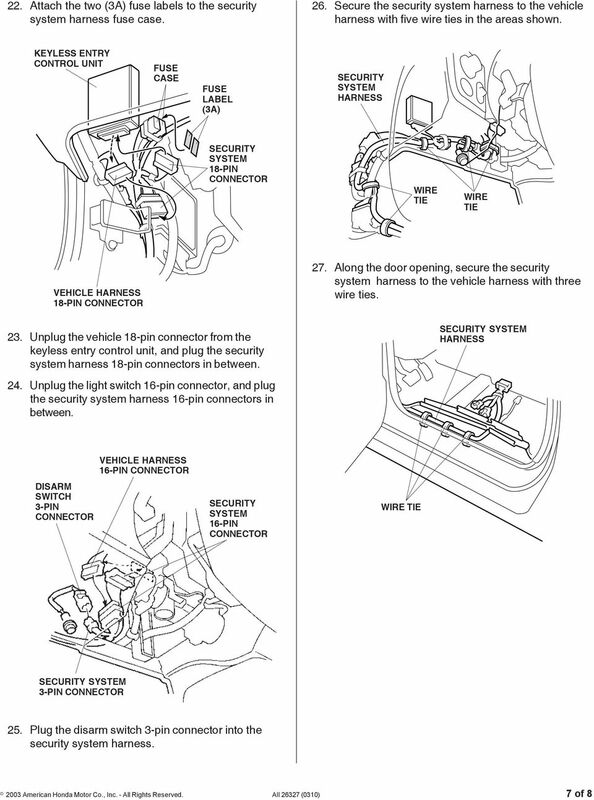 Unplug the vehicle harness 17-pin connector, and plug the security system harness 17-pin connectors in between. 21. 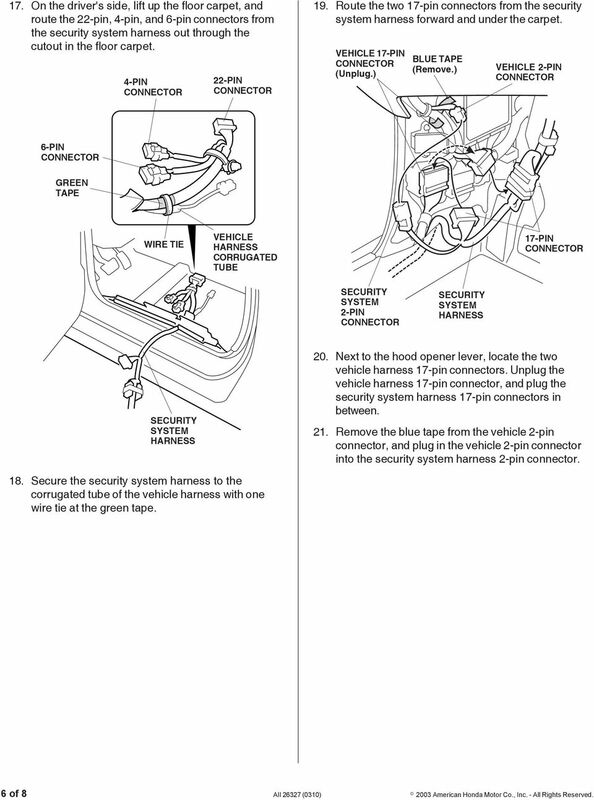 Remove the blue tape from the vehicle 2-pin connector, and plug in the vehicle 2-pin connector into the security system harness 2-pin connector. 18. 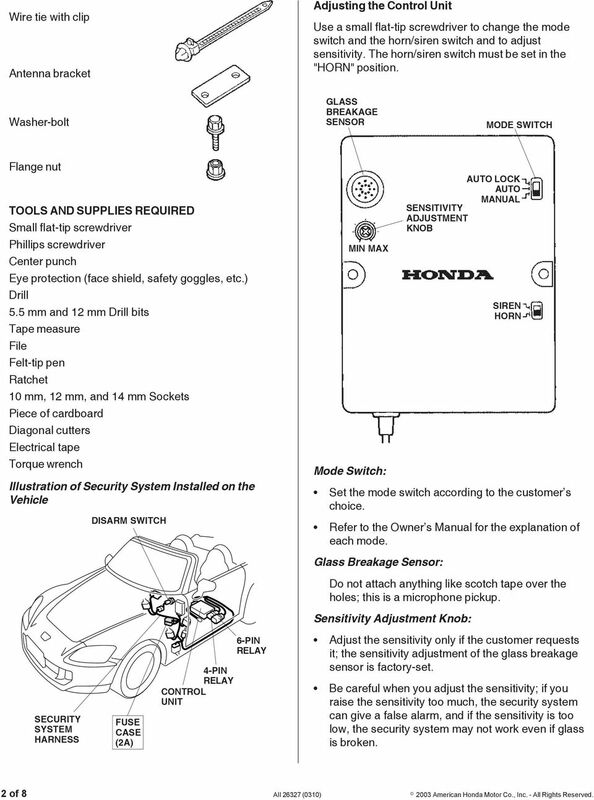 Secure the security system harness to the corrugated tube of the vehicle harness with one wire tie at the green tape. 6 of 8 AII (0310) 2003 American Honda Motor Co., Inc. - All Rights Reserved. 8 29. 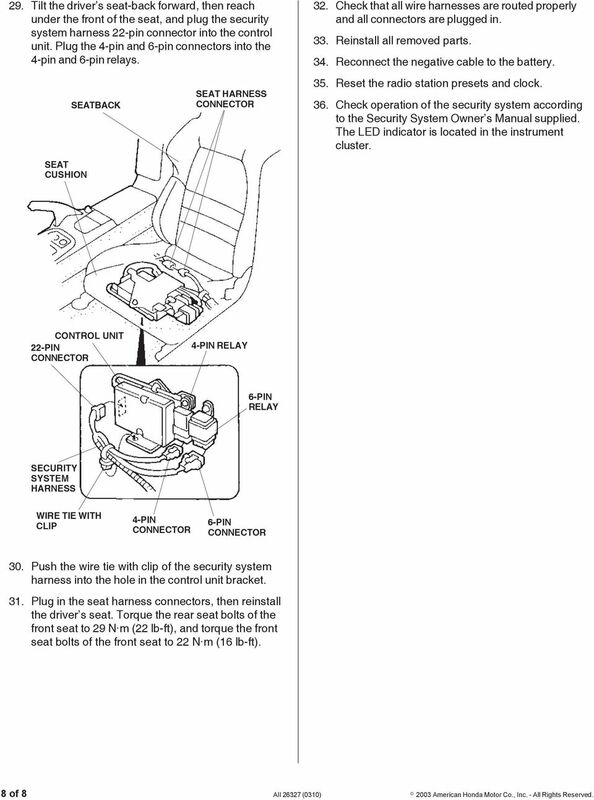 Tilt the driver s seat-back forward, then reach under the front of the seat, and plug the security system harness 22-pin connector into the control unit. Plug the 4-pin and 6-pin connectors into the 4-pin and 6-pin relays. SEAT CUSHION SEATBACK SEAT 32. Check that all wire harnesses are routed properly and all connectors are plugged in. 33. Reinstall all removed parts. 34. Reconnect the negative cable to the battery. 35. Reset the radio station presets and clock. 36. 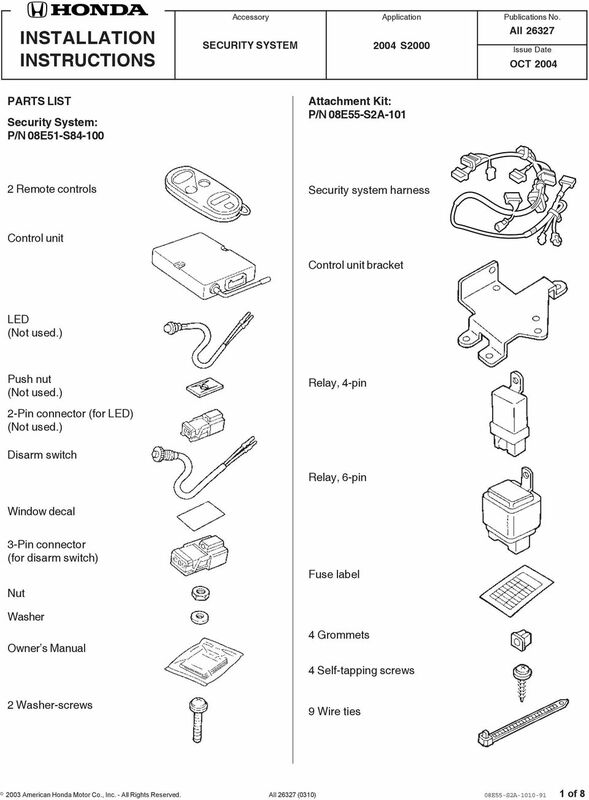 Check operation of the security system according to the Security System Owner s Manual supplied. The LED indicator is located in the instrument cluster. CONTROL UNIT 22-PIN 4-PIN RELAY 6-PIN RELAY WIRE TIE WITH 4-PIN 6-PIN 30. Push the wire tie with clip of the security system harness into the hole in the control unit bracket. 31. 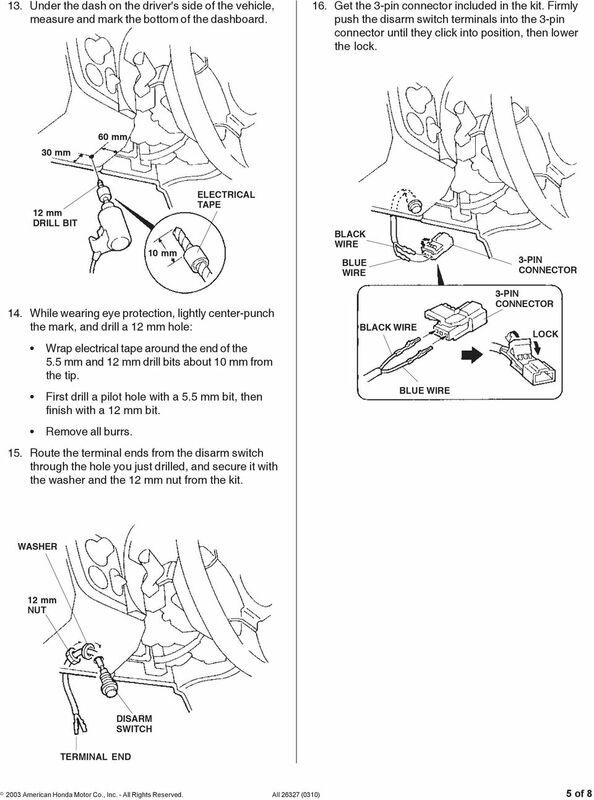 Plug in the seat harness connectors, then reinstall the driver s seat. Torque the rear seat bolts of the front seat to 29 N m (22 lb-ft), and torque the front seat bolts of the front seat to 22 N m (16 lb-ft). 8 of 8 AII (0310) 2003 American Honda Motor Co., Inc. - All Rights Reserved. SUBJECT: Retrofitting an auxiliary battery (code E28) with isolation relay (code E36). Electric Deck Lift. Assembly Instructions. Before You Start. Assembly Instructions. General Information. Further Assistance. Manual No. ** T23 * R PART NUMBER INSTALLATION INSTRUCTIONS FOR TOYOTA NAVIGATION SYSTEM NAVIGATION KIT PART N Manual Ref. Nr. 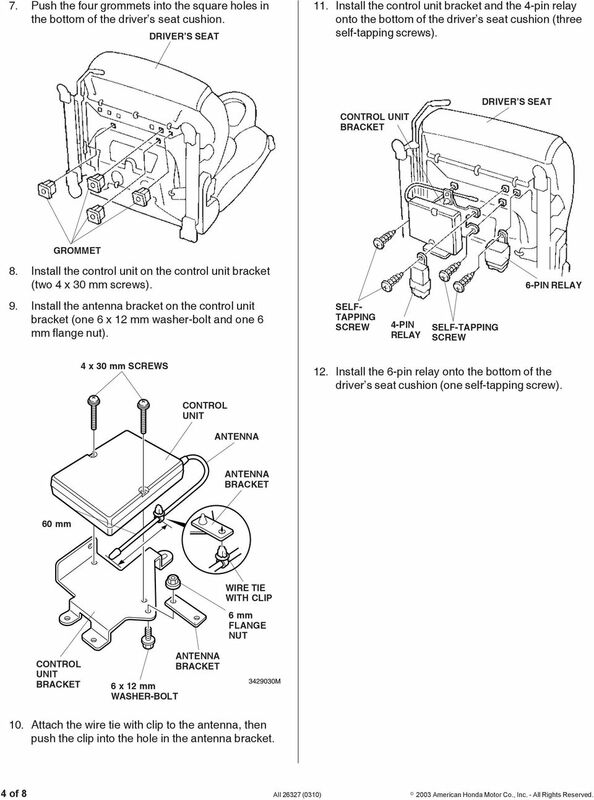 Lokar Cable Operated Sensor Kit Installation Instructions For GM TH350, TH400, TH200, 200-4R, 700-R4, 4L60 (and 4L60E, 4L80E with Long Selector Shaft) Building American Quality With A Lifetime Warranty!